The constitutional reform threatens to undermine fundamental economic and social rights for generations. The PEC 55 amendment, which has just been adopted by the Senate, requires that increases in public spending be limited to inflation-linked adjustments until 2036. Given that the population of Brazil is growing, and proportion of older people is also rising, this measure will significantly constrain investments in areas such as health, education and other social sectors that are crucial to the enjoyment of human rights. Indeed, investment in precisely these areas has been a key factor in the progress Brazil has made in reducing poverty and inequality in recent years – progress that may now be undone. Moreover, the amendment is likely to have a particularly detrimental impact on already disadvantaged groups, such as women, afro-Brazilians and people living in poverty, who rely more on public services. As explained in a joint letter sent to the Brazilian Senate by CESR and our Brazilian partners CONECTAS, Instituto de Estudos Socioeconômicos (INESC) and Oxfam Brasil, the constitutional reform stands in violation of Brazil’s obligations under international human rights law. Moreover, the continuing economic difficulties afflicting austerity-hit countries in Europe and beyond have demonstrated that such ill-conceived measures tend to exacerbate, rather than remedy, economic crises. What’s more, fairer and more effective alternatives to alleviate fiscal pressures, such as combatting tax evasion and pursuing more progressive taxation, are readily available to the Brazilian government but have not been pursued. As well as expressing concern to the Brazilian authorities, CESR and its partners brought the issue to the attention of the UN Special Rapporteur on Extreme Poverty and Human Rights, Philip Alston. Following a joint communication urging his intervention, the UN Special Rapporteur spoke out last week. “If this amendment is adopted it will place Brazil in a socially retrogressive category all of its own,” he said. “This is a radical measure, lacking in all nuance and compassion. It will hit the poorest and most vulnerable Brazilians the hardest, will increase inequality levels in an already very unequal society, and definitively signals that social rights are a very low priority for Brazil for the next 20 years.” The statement had an enormous impact in the Brazilian media, prompting over 100 news outlets to publish stories about the human rights impacts of this measure. The statement also became a key reference for opposition voiced within the Senate's Human Rights Commission. His declaration came hot on the heels of a similar intervention from the Inter-American Commission on Human Rights, which voiced its preoccupation about the proposal and also reminded the government of its obligations with regard to non-retrogression in the realization of economic and social rights. The PEC55 amendment is the latest in a series of austerity measures the Brazilian government has pursued with the aim of improving its sovereign debt rating on international financial markets. In May last year it announced a series of fiscal adjustments to the tune of 70 billion Reais, or US $20 billion. Civil society organizations in the country have also witnessed a worrying withdrawal of spaces for public participation and scrutiny of policies, as the government has limited opportunities for accountability and reduced transparency and access to information. In the face of this potentially-disastrous reform, CESR and our partners are working to protect the human rights of ordinary Brazilians. 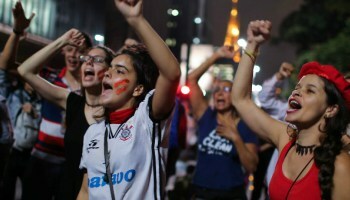 Drawing on our extensive experience in deploying the normative power of human rights in fiscal austerity debates, CESR will continue to work with allies on the ground in Brazil to challenge unjust fiscal reforms and propose fairer alternatives, including progressive tax measures, that can address the economic crisis whilst also protecting human rights. In the year ahead, we will deliver robust evidence of the human rights impacts of austerity measures in Brazil and carry out strategic advocacy against harmful austerity measures before national, regional and international human rights oversight bodies, along with international financial institutions such as the IMF. 2017 looks set to be a pivotal year for human rights in Brazil. With the government seemingly determined to lock in generational retrogression in economic and social rights, CESR and its allies stand ready to fight this injustice at every turn and to ensure more equitable and human rights-compliant solutions to the country’s ongoing economic difficulties.